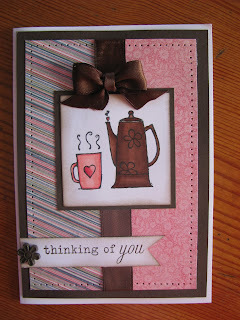 Well as promised back with the other card I made used the Morning cup Stamp Set from Stampin' Up! 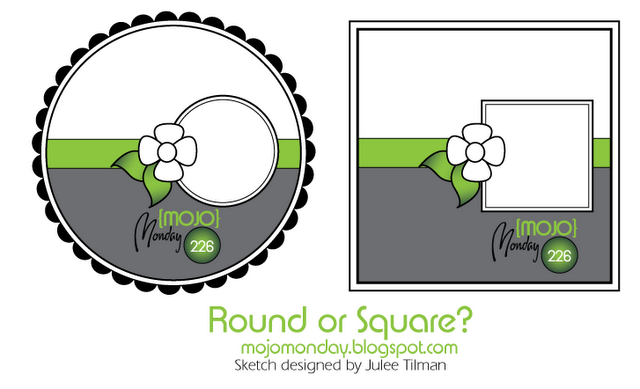 Now I am not big on making round cards and as for square well, will the excuse "I didn't have an envelope to fit" do??? I have used the same image as the last card and colourred it with my copics again and have used My Minds Eye, Stella and Rose papers and the greeting is from a PTI stamp set called UP Up and away. Well finally we have had some sunshine here so I have taken pics of all the cards I had made lately so I have plenty on hand for blogging, so hopefully I should be able to keep your interest going for a little while. I'm seriously impressed, 2 in 1 day. I love that set, never used it yet but just love it - and your card is another reason why. love the perforations too, totally love your card.